"I'm not going. 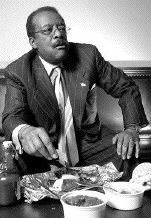 I'm eating my ribs"
Johnnie Cochran chows down on a plate of ribs at CTV's Toronto offices yesterday. He agreed to give an interview to National Post columnist Sharon Dunn if he was furnished with the meal. "These are very good," he observed. The way to a man's heart is still through his stomach. Best known for his defence of O.J. Simpson, Johnnie Cochran -- who has also represented such high profile names as Michael Jackson, Puff Daddy and Aretha Franklin -- has taken on groundbreaking cases in race relations. I met Mr. Cochran for lunch yesterday in the Green Room of CTV's The Mike Bullard Show where he was taping a segment for TSN's Off The Record. Lunch was difficult to arrange because of the famous lawyer's extremely tight schedule, until I mentioned to his public relations people that I would deliver the best ribs in town (ribs are Mr. Cochran's favourite food) if he would have lunch with me. Mr. Cochran agreed to the deal, and although lunch was slated for 12:30 p.m., he didn't show until 1:30. "Sorry about that," he said, "I was spending some time with Geronimo Pratt [now Geronimo Jijaga], one of my favourite clients who defines me better than anyone." Mr. Pratt was a member of the Black Panther Party and was convicted of the 1970 murder of a young teacher. "Pratt was locked up for 27 years," said Mr. Cochran. "It took three decades to prove that he was innocent." Sitting down to his feast -- smoked back ribs -- Mr. Cochran said: "This is awfully sweet." Staff from Dipamo's Barbeque have personally delivered the food, wanting to meet Mr. Cochran. "I love the guy," whispers Chris Fisher, Dipamo's manager. "Some people get offended when I say that, because of O.J. Simpson, but here's a guy who legally, with confidence and determination, handled the law over a period of time to find a man not guilty." After a quick taste of his ribs, Mr. Cochran declares them "delicious." U.S. defence attorney Johnnie Cochran, best known for defending O.J. Simpson, enjoys takeout ribs, the condition he set in granting the Post's Sharon Dunn an interview. He said in Toronto yesterday he has joined the fight to liberate Bill Sampson, sentenced to death in Saudi Arabia. "These are very good, someone knew what they were doing," he says between mouthfuls. Mr. Cochran speaks with extreme speed. "How do you do that," I ask, "-- eat and talk?" "It's good, and I'm hungry," he replies, telling me to go ahead with my questions. "There are those who find it ironic that you're involved with the Association in Defence of the Wrongly Accused," I say, "and yet, you had O.J. Simpson, a man guilty in the eyes of many, acquitted." "Everyone's entitled to his own opinion," says Mr. Cochran, "but the jury found him not guilty. This is the way the justice system works, and I hope that people believe in that system." I rephrase the question: "Would you represent a guilty man?" "Only from the standpoint that he would plead guilty," he says. "O.J. proclaimed his innocence to us throughout." Mr. Cochran says his assessment of O.J. is based not only on O.J. 's plea of innocence, but on the evidence itself. "Remember, the jury was sequestered for a full year," he adds. One of Mr. Cochran's aides interjects: "We have to go." "I'm not going, I'm eating my ribs," Mr. Cochran says kindly, but stubbornly. His handlers don't have a chance: Mr. Cochran is not going anywhere. Instead, he launches into a passionate defence of the wrongly accused. "There are many individuals who have been freed and are off death row, due to DNA. It's so important in Canada and the U.S. for us to stick together because there is injustice everywhere." Besides getting involved in the Bill Sampson case, he tells me that he's working on a big case over the next year. "It's a toxic tort case involving a company ... that makes all kinds of products, even turf in football fields," he tells me. "Just about everyone in this town, Anniston, Alabama, is sick," says Mr. Cochran. "I'm representing 14,000 people, most of whom are dying from cancer, caused by PCBs in the air and water." Mr. Cochran is also passionate when he talks about the NFL and the lack of black coaches, another case he has adopted. "Seventy per cent of the NFL is made up of black players," says Mr. Cochran, "but of 500 coaches, there have only been six black coaches." "We really have to go," says an irate publicity person. "I want to finish my ribs," Mr. Cochran says as he continues to eat. "Sharon, could you just carry them, and come along," said the aide. She's not kidding -- I can see there is no way to separate Mr. Cochran from those ribs. "I'll take them to your car," I tell him.